A few weeks ago I returned from a trip to Portugal, and my longing for its fresh seafood-caught that morning by native coastal fisherman and grilled to your order the same evening- paired with a crisp regional Vinho Verde has stubbornly refused to cease. As a result, I attempted to recreate our favorite dish there, Acorda de Gambas (Bread Stew with Prawns). Acorda, a traditional Portuguese bread-based stew with a consistency similar to creamy risotto, is composed of mashed rustic italian bread, garlic, coriander, olive oil, white wine and salt. 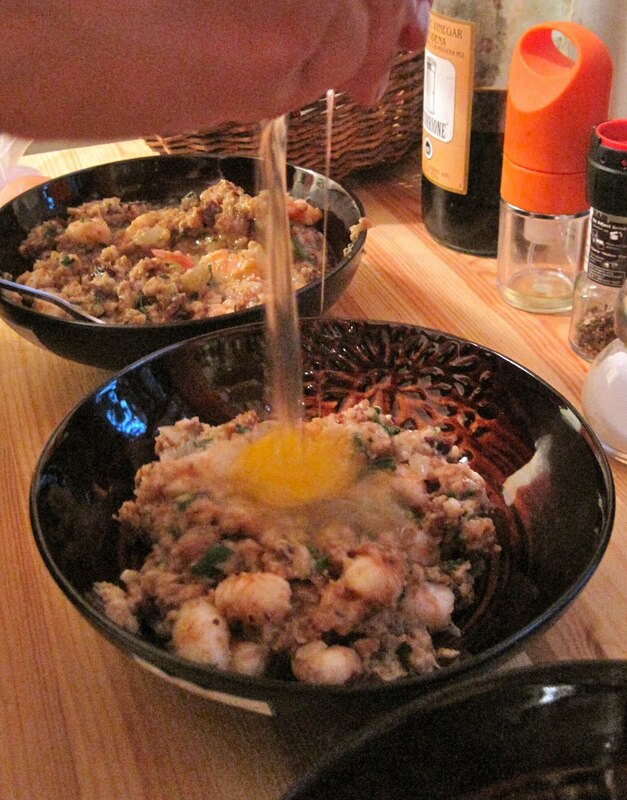 It is often served with local seafood, and our favorite version was simmered in a fragrant fish broth and tossed with fresh chopped parsley, shrimp, and and the signature final touch of the dish: a raw cracked egg, stirred into the dish upon arriving at your table. This will also be my first attempt to do a wine pairing with a dish! 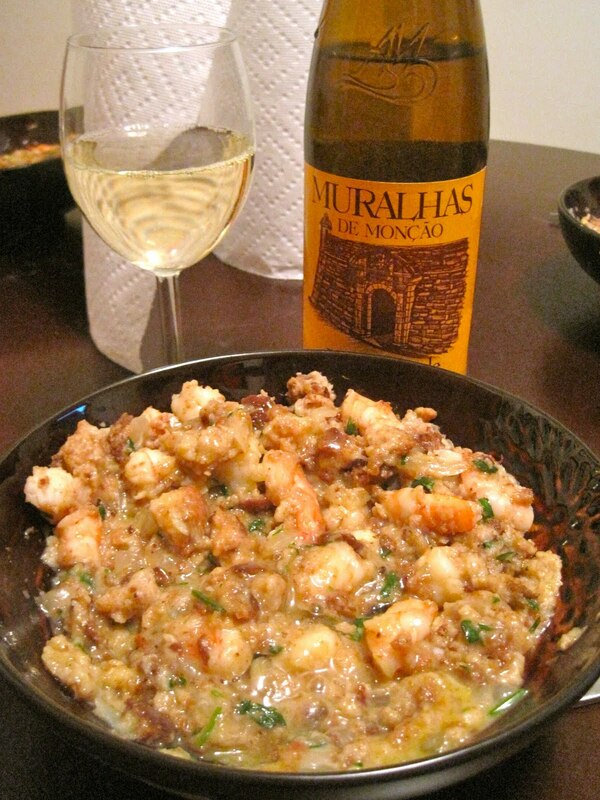 We ate our acorda with Vinho Verde, a Portuguese wine from the northern Minho region of the country. It translates to "Green Wine": the name is derived from the youthful fresh green nature of the grapes, which adds a faint greenish hue to its coloring. 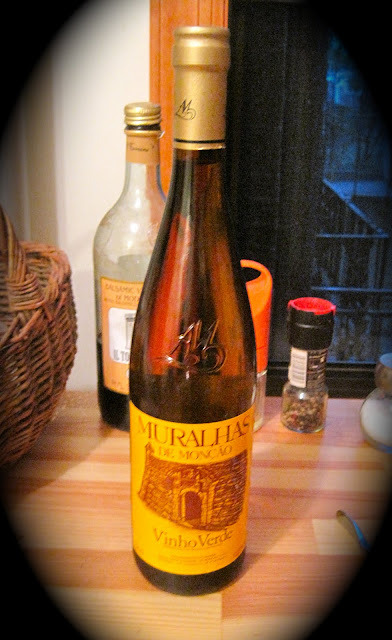 Vinho Verde is very dry, light and refreshing in its nature, so if you don't have access to this specific type I would try a dry Riesling instead. I adapted this recipe from one whose flavor was spot-on, but instructions not so clear (I think the recipe was not originally in English), so I will attempt to be as detailed and straightforward as possible below because this dish is truly spectacular. A sua saude! In a medium saucepan, heat 2 tablespoons of olive oil over medium-heat. Cut each prawn into three chunks. Add chopped prawns, the rest of the onion, coriander, paprika, and rest of parsley (chopped, stems removed.) Saute for about 8 minutes, until onion becomes translucent, stirring frequently. Set shrimp mixture aside. By now, your fish stock should be finished cooking (and emitting a wonderful fragrant brothy smell as evidence!) With a colander, drain the broth into a bowl, saving the garlic cloves. Mash them up, since they will be soft from soaking, and add them to the shrimp mixture. Set aside broth bowl. In the large pot where the fish stock was created, heat 2 tablespoons of olive oil over medium-low heat. Add the cubed bread and stir, and when olive oil is absorbed by bread add 2 more tablespoons. When bread has crisped slightly- make sure it does not burn- add the wine, then the stock, mashing the mixture as you go. It should first resemble the consistency of stuffing, then of a thick risotto as you continue to add liquid (see pictures below). Turn heat to low as you mash. When the thick risotto consistency is achieved, gently stir in the shrimp mixture, and a generous sprinkle of salt & pepper. Scoop the acorda into three separate bowls. Before serving- and I recommend doing this at the table, as it makes quite the presentation- crack a raw egg over each bowl and quickly stir into acorda until the egg is dissolved. Tried this in Lisbon last week - loved it! I've made this recipe many times, it's a favorite! I do use fresh coriander (cilantro) instead of dried, as well as parsley, and its really good. I was born and brought up in Portugal, now living in the USA. This is the best acorda recipe I've tried. I use fresh parsley and coriander (cilantro/cuentros) in equal amounts and its fab! I use a loaf of Pugliese bread as it's thick and tasty, and a good olive oil and plenty of it. If I can't find vinho verde, pinot grigio is fine. Try it, it's really good comfort food.